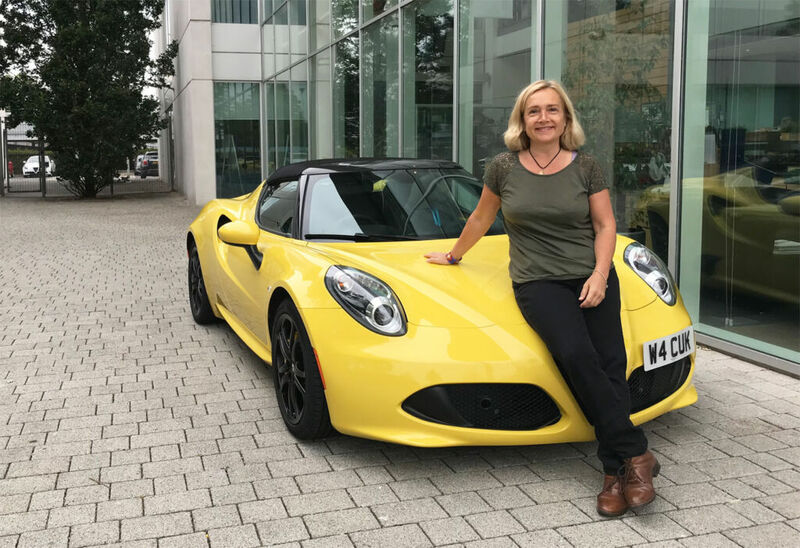 Gina Baksa feels the G-Force in the stunning Alfa Romeo 4C Spider. The words ‘Slough’ and ‘Alfa Romeo’ are incongruous bedfellows, but upon collection of the 4C at Fiat Chrysler’s HQ, I make a move worthy of David Brent – stepping over the wide sill and sinking down into the thoroughbred’s low-level racing seats with their monogrammed Alfa motif. And take a breath… This is one exciting sports car. I’m snug in the pared-down cabin that’s been stripped of unnecessaries to achieve a streamlined weight of just 895kg. There’s plenty of legroom for me, but taller drivers might find it cramped. Unassisted steering here, which is novel but turns out not to be an issue. This is a wide car (6 ft 11) but not too long at 13 feet. There is no GPS (thanks Google maps) and no rearview camera, but does have useful parking sensors. The pedals are excellently placed though – once I’d moved the seat forward, and although unused to such a forward and low driving position, it was surprisingly comfortable. 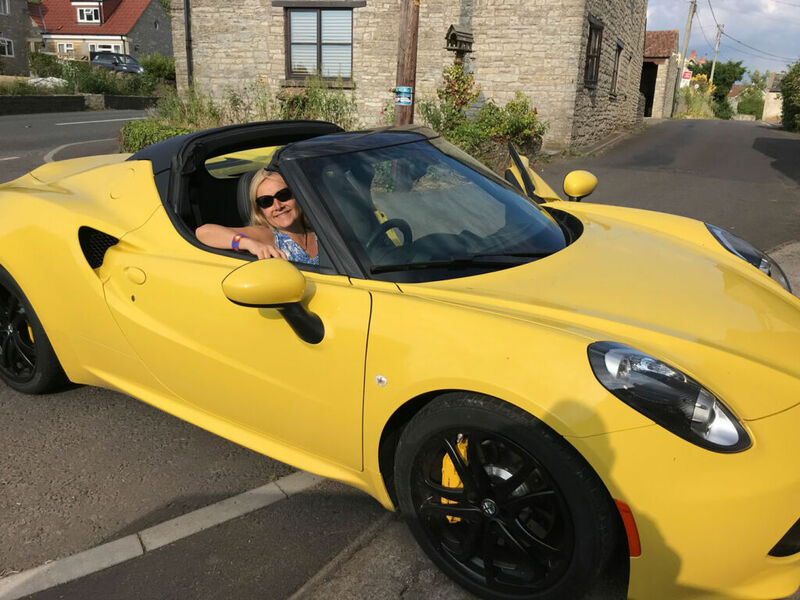 I was a little concerned to see open wiring by my right foot – it’s very kit car down there – but that’s the pared down specialness of the 4C Spider. 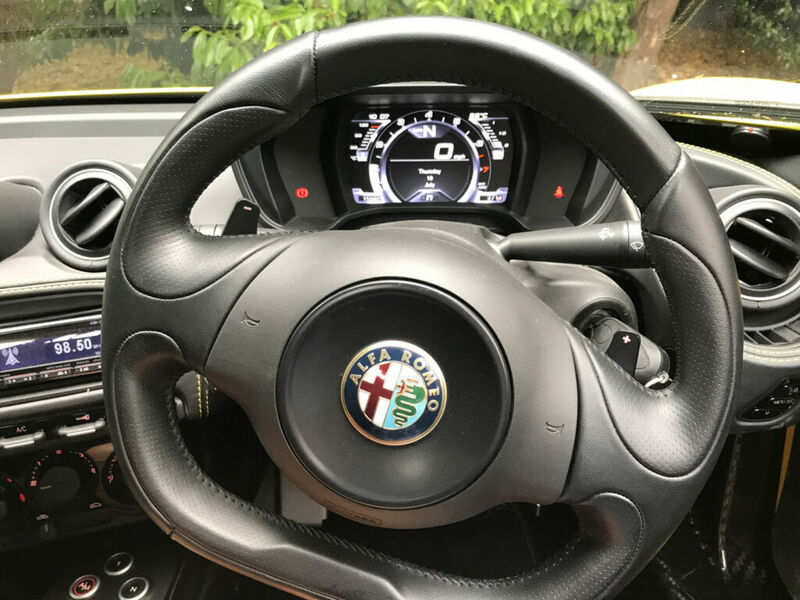 The leather steering wheel is adjustable (both rake and reach), with an excellent TFT screen showing journey information, gear position, speed and revs. 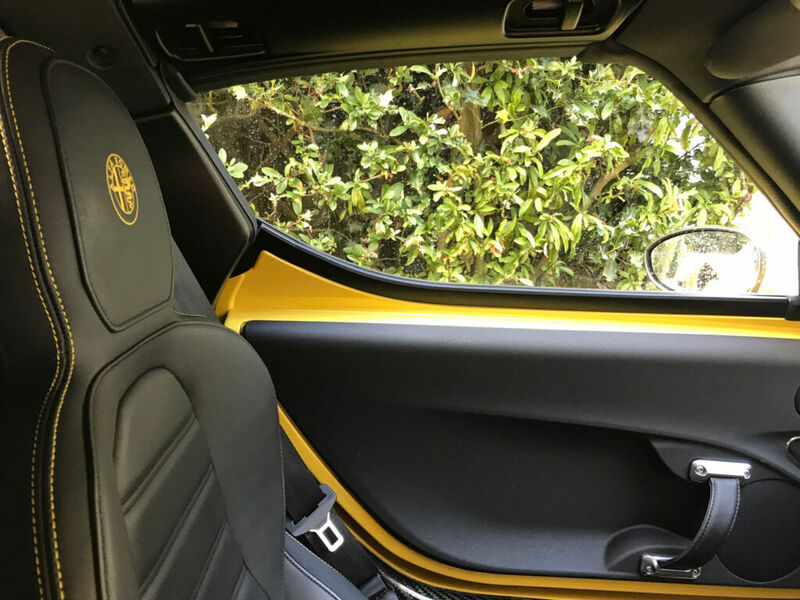 The trim was yellow stitching on gorgeous leather racing seats, while handbrake and gear controls were well placed in the central console. AC, demisters and car lock are also easy to reach and I especially liked the 4C logo in yellow on the floor mats. Phone charging is done via the cigarette lighter and there’s a handy cup holder here too. As well as storage in the shape of a saddle bag with a clip. I created more storage (if you can call it that) by having my seat so far forward it provided room for a small bag and my coats. There’s no glovebox. She’s a beautiful aerodynamic design: all long lines, curves and fabulous elongated front casing for the elegant Bi-Xenon headlamps set into the front bonnet that slopes down to three grilles and the famous Alfa badge: the red cross of Milan (Alfa’s home town) and the snake – the emblem of the Milanese Visconti family. This single carbon fibre chassis weighs just 73kg. Elsewhere, leather door pulls, aluminium pedals and a flat-bottom wheel create a sense of occasion to match the flamboyant exterior. Leather seats, cruise control and floor mats are optional, but air-conditioning is a no-cost option. A key start and the rear-mounted 4-cylinders burst into life a throaty gargle-grunt that turns into a crackling roar as I squeeze out the revs, and the huge smile on my face reminds me how much pleasure I derive from hearing the roar of supercar petrol engines (electric car silence? Non grazie). I growl my way out of Slough (the Spider starts to moan in low revs and feels like a colt at the starting gate) and make my way onto the M4. The 4C can sense the open road ahead and is chomping at the bit. Her 6 gears are automatic, which makes for more relaxing driving but the paddles either side of the steering column can take you into manual in seconds – an equally engaging drive. As I move from inside to outside lanes and pick up speed in seconds, the twin exhausts give out a delicious raspy growl as she shifts up and down – with ease and not too much lag into the turbo. So exciting! Acceleration is a beast in the 4C Spider 1750 TBI: with a G-Force activating 0-62mph in just 4.5 seconds. And when the white van men zoom up behind me in their inconsequential Transits, (shocked and awed to see a woman at the wheel) I floor the Spider with glee leaving a smoky trail in my wake as I roar off down the outside lane. Pure joy! 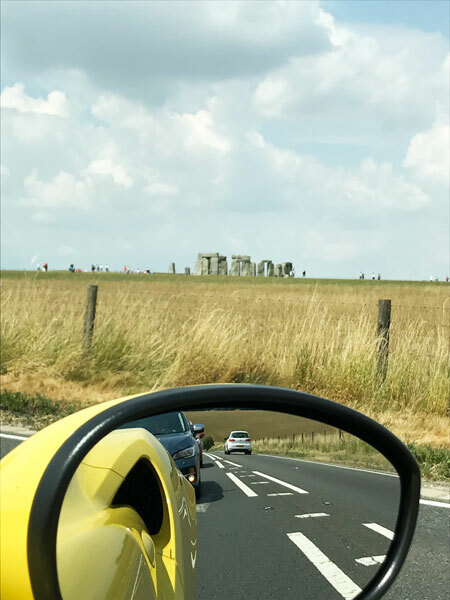 Heaven is a summer day in a supercar convertible – once the roof is down I cool down and had the most excellent ride. The most fun I’ve had in a car for ages and a grin that stayed on my face all day. Visibility is excellent out of the wing mirrors so I was always aware of approaching vehicles. And forward viz is good too, despite the seat being so low and not height adjustable. The view out the rear is a little more challenging for parking, as all I could see was the Spider’s engine and her muscly flanks.